For the first time in the series’ history, the FABLE III score is no longer graced by the presence of Danny Elfman’s hallowed name. To be fair, even in the first two scores his only contribution was the main theme, but even so, this latest game in the trilogy is our first glimpse of RUSSELL SHAW working without any outside assistance for this series — he’s on his own here. The game, like its predecessors, is a quirky fantasy story with memorable characters, a good sense of humour, and an attractive and vibrant art style. It’s something of a dream for any composer to have such a colourful palette of visuals to compose to. 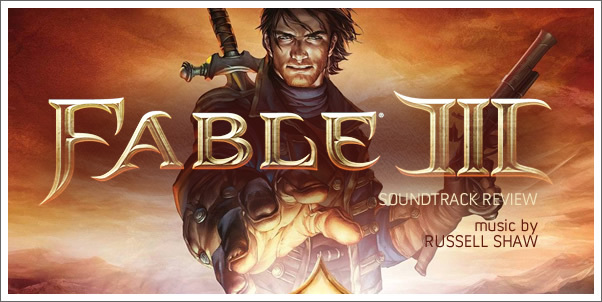 SHAW is Lionhead Games’ in-house composer, which is why many will recognize him as the maestro behind Dungeon Keeper and Black & White. Unfortunately, despite solid live performances by the Slovak National Symphony and Pinewood Singers, SHAW’s score fails to muster much energy or distinctive appeal.